It was the month's worst performing 3D printing stock. What: Stratasys (NASDAQ:SSYS) was the worst performing well-known 3D printing stock in January, finishing down over 33%. By comparison, 3D Systems (NYSE:DDD) lost about 18% of its value. Both companies significantly underperformed the S&P 500. 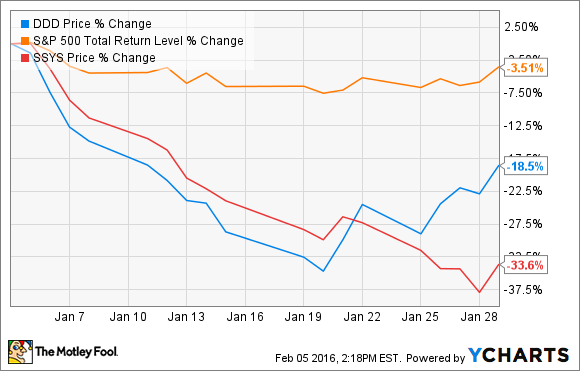 So what: Three main factors likely contributed to Stratasys' steep January decline. First, the broader market's sell-off was the worst start to a year in stock market history. Fears have escalated that China's economic engine is stalling much more dramatically than previously anticipated. Although Stratasys doesn't have a particularly large presence in China, many of its larger industrial customers rely on the Middle Kingdom for business. Investors could be concluding that what's bad for Stratasys' customers is also bad for Stratasys. Second, the bearish consensus among Wall Street pros was on the rise in in January across the sector. Stratasys was downgraded by Jefferies and JP Morgan, while 3D Systems was downgraded by Jefferies, UBS, and Canaccord. This loss of confidence could be weighing on shares. Third, like 3D Systems, Stratasys experienced a notable slowdown in customer spending during the first nine months of 2015, as its hardware sales fell more than 14% year over year. The company believes the industry expanded too quickly in 2013 and 2014 and created an oversupply of capacity in the market. Consequently, customers have slowed their purchases and are using their existing capacity already on hand to increase output. If this theory holds true, it stands to reason that Stratasys' hardware sales should improve as excess capacity in the market becomes more constrained. Now what: Stratasys is tentatively scheduled to report its fourth-quarter and full-year 2015 year earnings on March 2. The most pressing questions are whether the fall in customer demand has persisted and if China's slowdown will hurt its prospects further. Until investors have a better understanding of where Stratasys' business is headed, the stock will likely continue being at the mercy of Mr. Market.